The early Church consisted of small groups meeting within people’s homes or small public rooms or open air spaces. I am so impressed by youth who commit themselves to these kinds of groups to this very day. I am reminded of how St. Alphonsus gathered people in faith sharing groups at the butcher’s shop or in a courtyard in Naples. 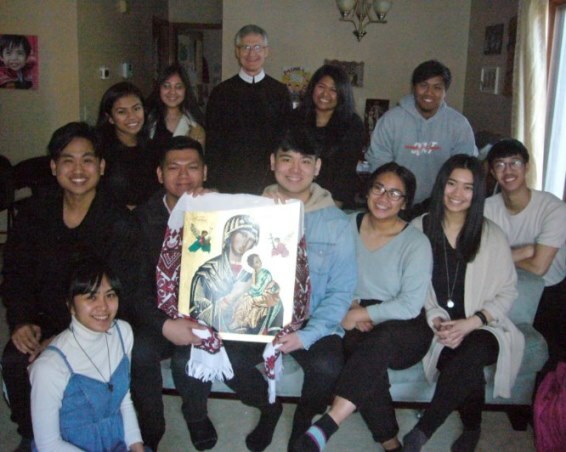 Recently in Winnipeg, meeting in a “Household” group, were the Couples for Christ-Youth. We meditated on the golden slipper dropping from Jesus’ foot, as seen in the Icon of Our Mother of Perpetual Help. With the help of the prayers of St. Alphonsus, we looked at how much Jesus “gave up,” as he let go of his place in heaven to take on our flesh. We also shared what we can give up for Lent, that helps us to better love and serve those around us, in our family, our community, and in our world. While in Winnipeg, I was encouraged to see the strength of this “church in your house,” at work in The Welcome Home. Sunday the Divine Liturgy is celebrated, then a men’s group or a young adult group takes place on Tuesday evening, food is shared out on Wednesday morning, followed by a women’s cooking skills group in the afternoon, a community evening on Thursday with vespers and supper, Saturday brings the “Sound of Music” as children attend piano lessons, plus many other events; this is an amazing mission of St. Alphonsus. In the picture at the right, I am standing in front of The Welcome Home where many people passed through to pick up groceries, a bag lunch, and some hot chocolate. The warm drink was appreciated as some people stood outside in minus 13 degrees Celsius, for half an hour before the doors opened.